You can imagine my delight as Emily started on the road to recover her driving licence 3 years after her spinal cord injury. We arrived for the initial assessment. I had packed a lunch and a book so stayed in the comfort of the office while Emily hit the streets! I am the sort of nervous driving instructor that when my children drove too close to parked cars I just lent away and drew my knee up. As the learner driver approached stop signs I always braked heavily on the mat while smiling through gritted teeth. I have uttered numerous high-pitched “watch out“, “to your left” ,”to your right.” All while leaning and changing imaginary gears as the passenger. I was tempted to hand neighbours and friends wads of cash in an unmarked envelope rather than instruct the learner myself. But what happens in the car stays in the car! Upon our arrival for the driving assessment I was content reading my book and munching my sarnie. 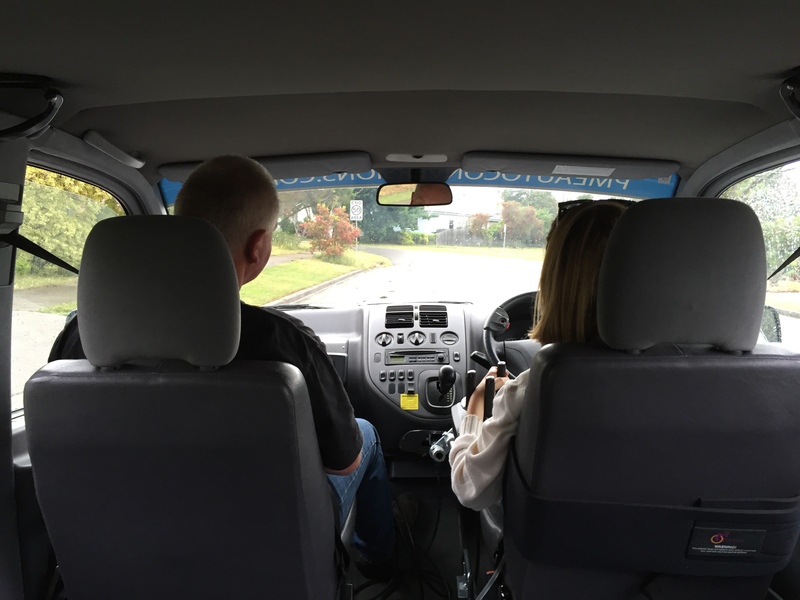 After a couple of hours the modified van returned and Tom, the instructor, invited me to join them on a practice run around the residential roads. I buckled up in the back of the adapted bus, glad that I wasn’t driving the huge vehicle. Emily had to control the accelerator and brake with her right hand whilst steering with her left hand. Each maneuver was action-ed independently so her hands were circling left and right, clockwise and anticlockwise, forward and back. I was dizzy in the back just thinking about it but Emily was a natural. Before I could change my imaginary gears we were off up the street, turning left and right and tackling three-point turns. I was unusually mute, a rare occasion. I didn’t want to break anyone’s eye contact with the road or their concentration on circling hand movements. I had a couple of leaning moments but managed to remain silent. Emily reached speeds of 30kms and Tom was ecstatic about her ability to control the monster bus. Emily has to apply for a revised power chair with a locking pin to secure herself into an adapted car. When the chair is confirmed the car can be discussed, bought and modified. Only then will Tom organize Emily’s driving lessons towards passing her test. It’s absolutely wonderful and I am genuinely thrilled that Emily is on the road to independence. Especially as she isn’t prioritized to board the M30 bus, being left on the curb occurs more often than not. I am not qualified to do anything regarding Emily’s return to driving after spinal cord injury….. unless you need high-pitched, knee jerking directions! I will happily be eating sandwiches and reading a book waiting for my chauffeur to be trained! 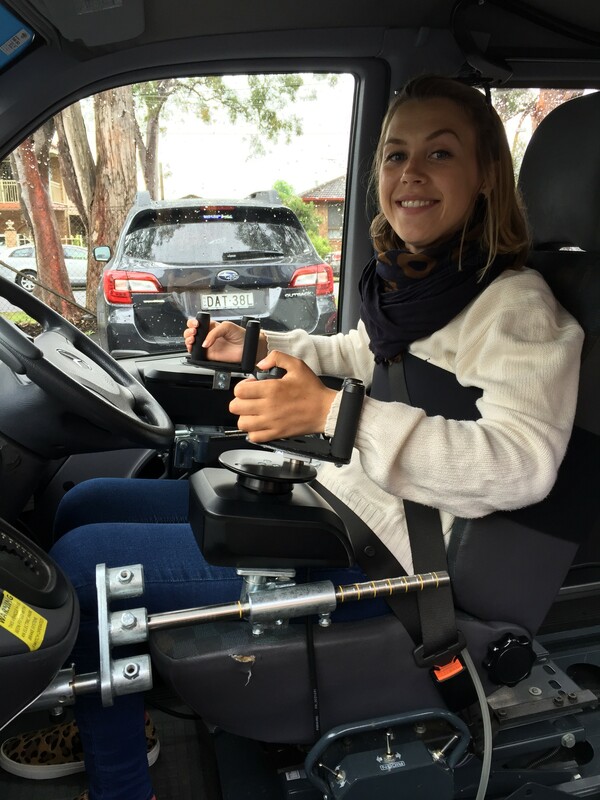 Emily passed her driving assessment in the modified vehicle. This entry was posted in Life after SCI, Lifestyle Choices and tagged Driving after SCI by everydaycarer. Bookmark the permalink.